It is chili season. I decided to make a special chili that is a bit salty and sweet. 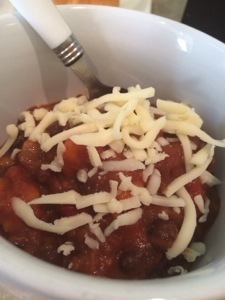 A vegetarian chili that everyone would love. Start by heating your slow cooker to the lowest setting. Spray the inside lightly with no stick spray. Add the chopped onion and all the seasoning and mix together. Allow the onion to cook for 15 minutes. Then add the remaining ingredients. Add about one half cup of water or chicken broth. If it still seems think add an additional 1/2 cup. Serve warm with cheese and a gluten free roll!